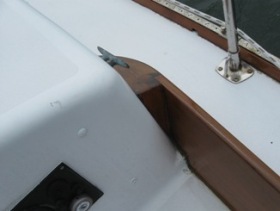 Sloop du Jour is a beautifully maintained early Dolphin about which we needed to get more information. 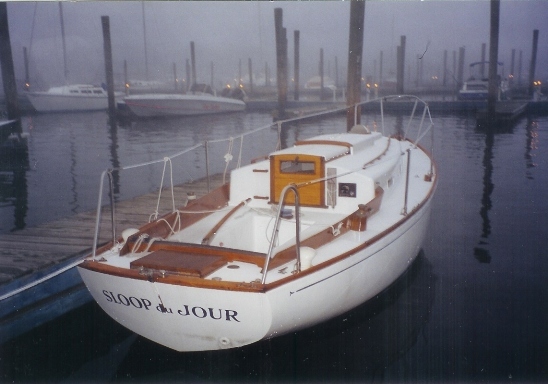 We first found about this boat when, one misty October evening at haul out time several years ago at Crockers Boatyard in New London, CT, your webmaster saw this boat and took this picture. June 14, 2009 - Peggy Benkard, who owns Sloup du Jour, keeps her at West Harbor, Fishers Island, New York. She told us of another Dolphin 24 that was at Fishers Island Peach Blossom. This boat belonged to a Paul Cox, now deceased. Peggy told us Paul sold it several years ago to someone from Michigan. 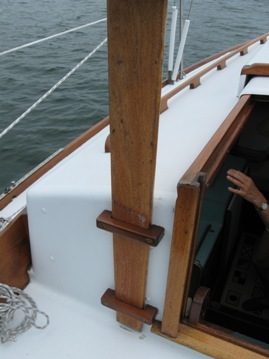 She also advised that Peach Blossom was older than her boat, and had a pole strut down below to support the mast. This developed into an interesting story. Click here to go there. On July 28, 2009 your webmaster finally met Peggy Benkard on Fishers Island. 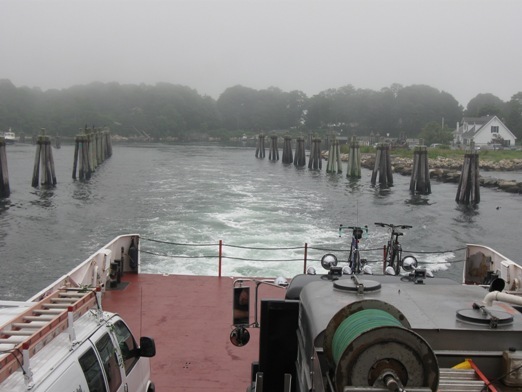 I had hoped to sail over to West Harbor in Marionette but the weather, again, did not cooperate so I took the 11:00 ferry from New London. At least I got there by boat! We spent several pleasant hours talking about Dolphins and looking at the website, having lunch (she bought), reviewing the 'Black Book' she received when she bought the boat in 1976/77 (more on the Black Book later), taking pictures on Sloop du Jour, fruitlessly looking for the hull number nameplate, a memorable driving tour of that part of the Island on the other side of the guarded gate, and finally, ice cream cones at Toppers before catching the 4:45 ferry back to New London. 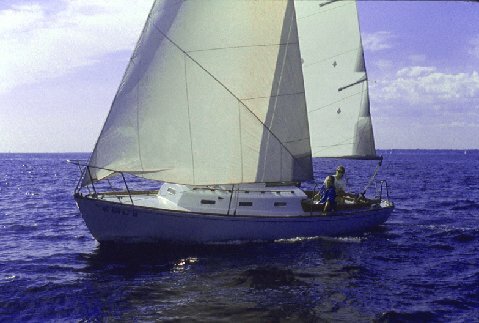 Peggy bought Sloop du Jour from Sam Jones of Fenwick, Old Saybrook, CT in 1976/77. Her name then was Julep. 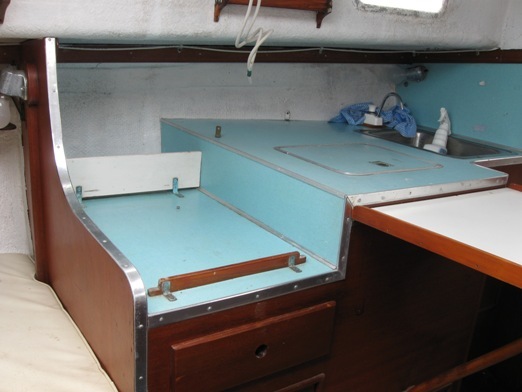 She was stored for the winters at Saybrook Marine Services (now the Between the Bridges Marina) in Old Saybrook, and owner Stu Woodman handled the sale. Peggy replaced the original Palmer engine with a Volvo diesel. 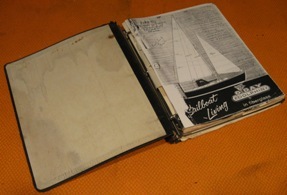 In the 'Black Book" was a quotation letter dated June 4, 1962 from Bob Larson, President of US Yachts, the sales and marketing agent for O'Day, to a Fred Crossman of Maplewood, New Jersey. 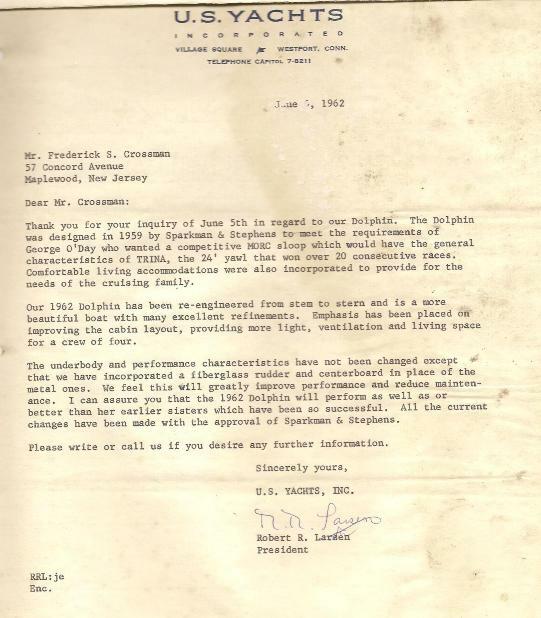 This letter suggests that Fred was the first owner. Click here to see that letter. Click your browser's back arrow to get back here. Or, Fred got a quote on a new boat but instead bought a used boat? Efforts, so far to track down Fred have been fruitless. This letter is an unsolved mystery. 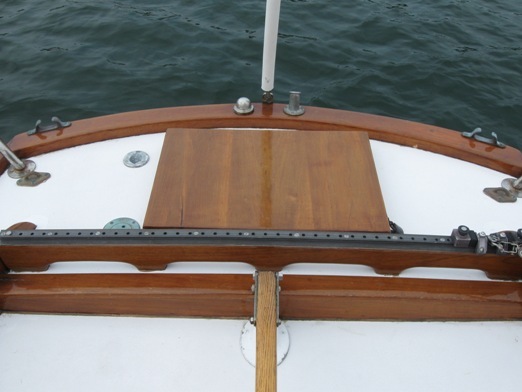 Sam Jones told us that this hatch was built by Seth Person whose boat yard on the Connecticut River, built Finisterre, and wood 12 meter boats for the America's Cup. I'll bet he made the raised traveller bar as well. 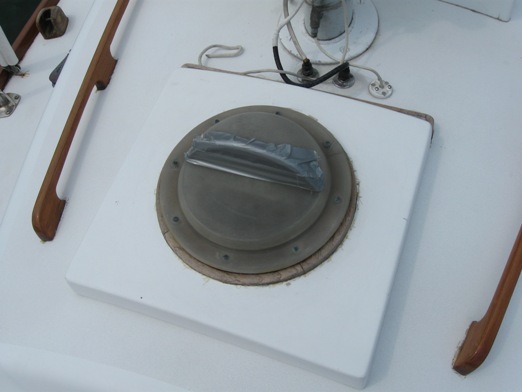 Peggy is planning to replace this vent, possibly with a stainless solar powered fan vent. 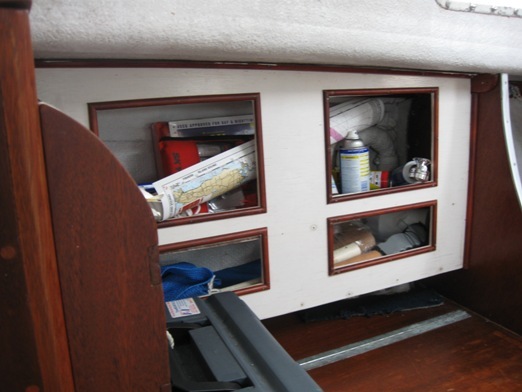 Sloop du Jour's galley set up is interesting. 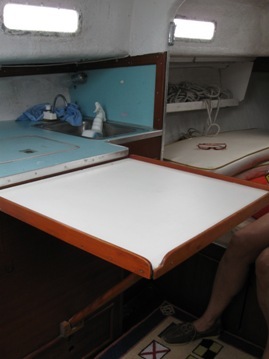 The table hinges up from in front of the galley, and is held in place by that angled leg in the lower left picture. 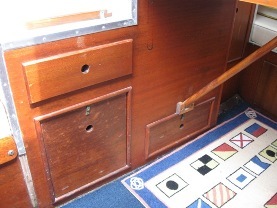 Lockers are below the cutout for the stove. 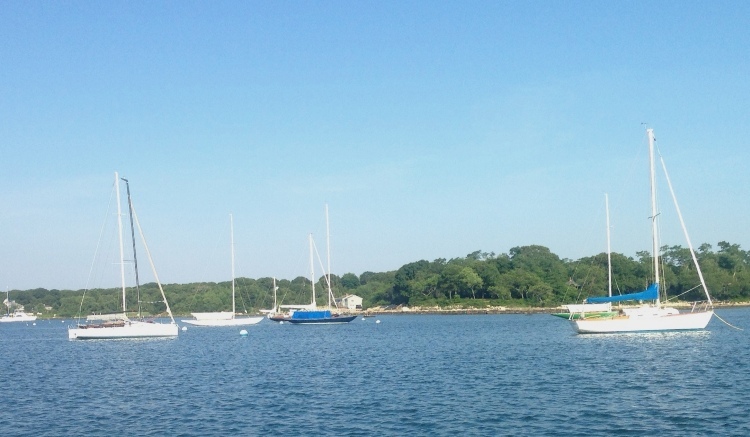 Leaving Eel Pond on Fishers Island by ferry. 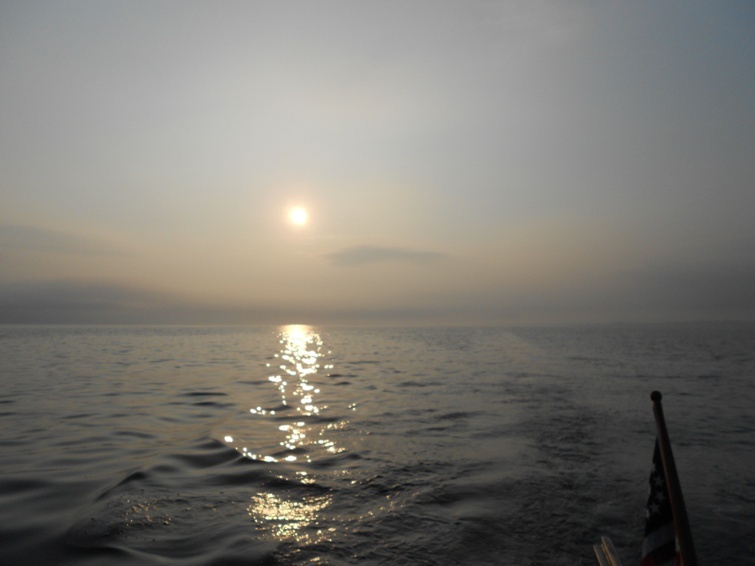 The fog was so thick on this less than 1 hour passage that the ferry actually stopped after about 20 minutes into the voyage and repeatedly blew its fog horn into about 200 yards of visability. We never saw anything. Hopefully, their radar did. March 14, 2012. 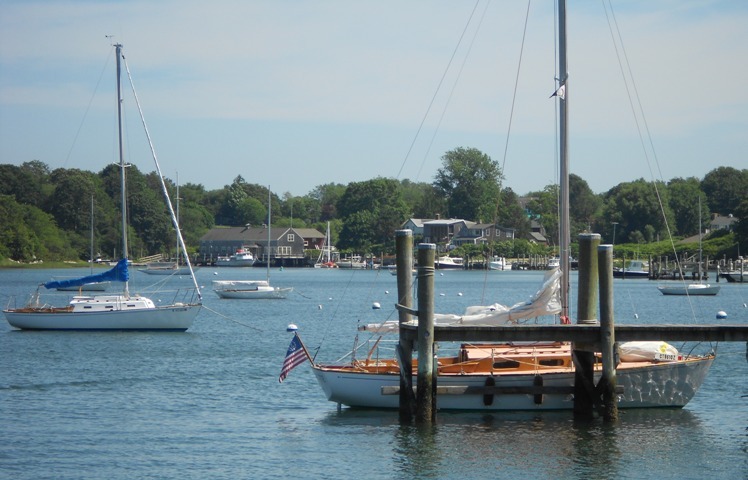 We know Sloop du Jour was Sam Jones' Julep in Fenwick, CT, bought by him in the late 1960's. Up until now we did not know where Julep came from, and did not know how old she was - no hull #. 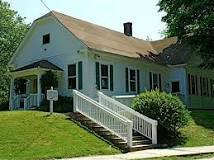 New DFI analysis indicates that Don Haydon sold his Dionis, O'Day #21, to a man from Fenwick in the late 1960s. Fenwick, a borough of Old Saybrook, CT, the smallest borough in the state of Connecticut, is located on Long Island Sound at the western side of the CT River. It had a 2000 census population of 52 and a very nice golf course. A famous resident of this borough was Katherine Heburn. As we are confident that only one Dolphin could have entered the tiny Fenwick community in the late 1960s (Sam Jones would certainly have known about it if there 2 Dolphins there!) we feel that Dionis must, therefore, be Julep. July 9, 2013. It was four years ago this month your webmaster and Peggy meet to discuss Dolphin matters, and that's a long time to wait for my turn to buy lunch. But now, we're even! Marionette made the 2 1/2 hr voyage from Niantic Bay to West Harbor tieing up at the Fishers Island Yacht Club Docks - with Sloop du Jour on her mooring just off our port quarter. After lunch Peggy and I conducted an extensive review of various Dolphin matters at the Fishers Island Library, making good use of their large screen computer monitor. July 8, 2016. Larry Kurt, ex crew on his dad's The Rachael K, sent in this photo.